NETGEAR's AC5300 class R8500 Nighthawk X8 marks the debut of Broadcom's new 4x4 radio SoC announced almost a year ago at CES 2015. The R8500 is a 4x4 AC5300 class three-radio router, based on Broadcom's XStream technology. XStream was birthed as a delaying tactic when Broadcom didn't have a MU-MIMO solution to offer. But now Broadcom is trying to pull ahead of Qualcomm by offering both more 5 GHz radios and MU-MIMO to provide two ways to optimize total bandwidth use in busy wireless networks. The MU-MIMO part of the equation, however, isn't quite baked yet and not enabled in R8500's you can buy today. A note on the R8500's spec page says: "MU-MIMO feature requires firmware upgrade. MU-MIMO firmware upgrade not currently available for this product, but currently anticipated to be released before the end of 2015". Since we have only six more weeks to go in 2015, we'll soon see if that anticipation is realized. The R8500 is quite a big boy, the largest yet, in fact, to hit the SmallNetBuilder test bench. With its outer two antennas set to their recommended 45° angle, this $300 (boy, did that price come down fast from the initial $400) router will stake out a 17" x 10.5" footprint wherever it sits, plus 7.5" above it to accommodate its four external active antennas. 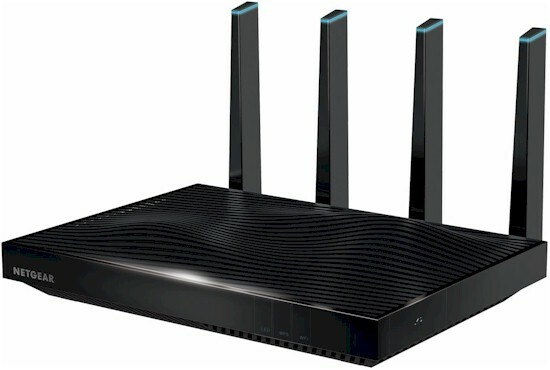 In hope of further convincing buyers that almost half a grand isn't too much to lavish on your WLAN, NETGEAR has built amplifiers into the four external antennas and topped each one with a blue light to remind you. Both top and bottom of the router have lots of ventilation slots to keep things cool. The router top has a dual-humped wave design that will discourage you from stacking anything on top of it.There are two mounting screw slots on the bottom that will point the connectors up when wall-mounting the router. All link / activity lights are arrayed in a column on the top left of the router. NETGEAR didn't skimp on indicators, as the callouts below show. In cause you (or your spouse) aren't blinky-light fans, there is a handy switch right on the front panel that will keep 'em on and stop their blinking or shut them off completely. The USB 2.0 and 3.0 ports are behind a flip-down panel around the corner. All seven Ethernet ports are Gigabit; one WAN; two aggregatable LAN; and four plain old LAN. The aggregatable ports support LACP (802.3ad) that, when used with a device or switch that also supports LACP, doubles Ethernet bandwidth on that link only. Keep in mind aggregation does not increase bandwidth for a single device. But if you have multiple Gigabit Ethernet devices trying to simultaneously move big files to / from a NAS that also supports LACP, you should see transfers complete more quickly. Short term confidentiality conveniently expired a few days ago, so I was able to use the FCC ID documents for component identification. The photo below shows the top of the R8500's board with heatsink and RF can tops removed. Thermal pads obscure most of the components in this photo. But there are closeups in the FCC ID filing that provide clear component views. All key components are summarized in Table 1. AC5300 class routers use the same tri-radio Broadcom XStream design as AC3200 class routers. The difference with AC5300 is it uses Broadcom's BCM4366 4x4 2.4/5G single chip 802.11ac SoC. This chip has four transmit / receive chains and supports 20/40/80 MHz bandwidth modes in 5 GHz and 20/40 MHz in 2.4, just like other 4x4 802.11ac designs. But other 4x4 designs support maximum link rates of 800 Mbps in 2.4 and 1733 Mbps in 5 GHz. So how does Broadcom get 1000 and 2165 Mbps? The answer is the BCM4366 supports 1024-QAM modulation. Like Broadcom's introduction of 256-QAM support in 2.4 GHz that begat AC1900 class products, 1024-QAM support lets Broadcom claim higher link rates for AC3100 and AC5300 class products. (AC3100 is AC5300 with one 5 GHz radio and no SmartConnect.) Actually getting 1024-QAM link rates, however, is a heavy lift, requiring better RF components that aren't easy to come by. We'll see later how real these new link rates are. While router manufacturers have (surprisingly) chosen to round down to AC5300, Broadcom refers to its latest creation as AC5400. I suppose at some point, someone will break ranks and use the larger number. Like other AC3200 designs, there is a PLX PEX8603 PCIe switch to provide the extra PCIe port needed for the third radio. It sits to the left of the Broadcom BCM4709C0KFEBG SoC near photo center. Like its predecessor, the BCM4709, the BCM47094 is based on a dual-core Cortex A9 processor, but clocked at 1.4 GHz vs. the 4709's 1 GHz. As the block diagram above shows, the 47094 has USB 2.0 and 3.0 ports built in, plus a 5 port Gigabit switch. A key difference in Broadcom's AC5400 vs. its earlier AC3200 Smart Connect architecture is that the BCM4366 doesn't have a built-in co-processor. This means the Wi-Fi processing offloading present in AC3200 designs using the BCM43602 has moved back to the main processor. NETGEAR sent the block diagram below to show the BCM4366 does have an embedded 800 MHz ARM7 processor. It's good to see that AC5300 routers aren't claiming to have penta-core processors (two in the BCM47094, plus one each in the three BCM4366), at least not yet. Note the processor is marked BCM4709C0KFEBG, not BCM47094. I am told the two are the same. Although the BCM4709C0KFEBG processor is clocked at 1.4 GHz vs. the BCM4709's 1 GHz, it's still a dual-core Cortex A9 CPU. So the higher storage, routing and VPN performance some router tweakers have been assuming from the higher clock rate, may not be realized. In fact, our testing pretty much shows that. There has been some discussion in the Forums regarding NETGEAR's User Manual note in the Port Aggregation setup instructions that indicate Port 3 should always be used to connect the first Gigabit Ethernet device when ports 1 and 2 are configured in LACP. Examining the board traces reveals the reason for this advice. The WAN and LAN ports 1, 2 and 3 connect to the BCM4709C0KFEBG's internal switch, while ports 4,5 and 6 connect to a Broadcom BCM53125 7 port Gigabit switch. The second switch chip connects to the CPU via an RGMII port, which basically provides a 1 Gbps uplink port between the two switches. The view below with bottom cover removed shows antenna connections. Top connections go to the external active antennas from the 2.4 GHz (right) and 5 GHz-1 (left) radios. Bottom connections go to the 5 GHz-2 radio internal antennas. The 5 GHz-1 radio supports low-band channels 36, 40, 44 and 48; 5 GHz-2 supports high-band channels 149, 153, 157 and 161. View with heatsink and RF can tops removed. No active components on this side. Top side of board. Another heatsink covering all the RF cans. Board top with heatsink and RF can tops removed. Left to right top row: 2.4 GHz radio, CPU/RAM/Flash/PCIe, 5 GHz-1 (low band) radio. 5 GHz-2 (high band) radio is center bottom.